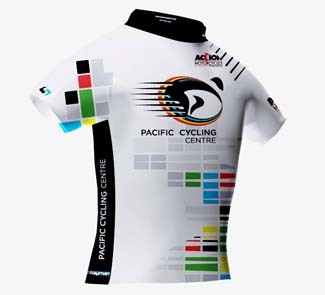 Pacific Cycling Centre athletes will be wearing new cycling clothing in 2011 due to a partnership formed with HaymanSport - Custom Sportswear. HaymanSport - based in Penticton, BC - has designed shirts and shorts that reflect PCC's branding and colours. "It's been great to work with the team at Vancouver Island’s Pacific Cycling Centre. I admire the dedication of coaches such as Houshang Amiri, who play such a vital role in developing high calibre cyclists in Canada," said Ron Hayman. "This is a partnership and sponsorship with two leading companies in BC," says Houshang Amiri, Head Coach at the Pacific Cycling Centre. "At PCC we are very excited to work with Ron Hayman and HaymanSport - Custom Sportswear. We believe the HaymanSport sponsorship offers amazing quality sports wear to PCC athletes across North America."